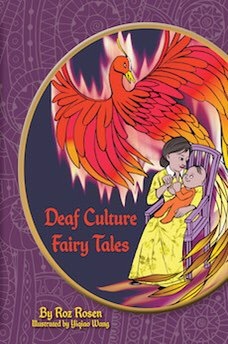 Roz Rosen tells a tale of a Deaf Cinderella who has been encouraged in her use of sign language until her mother dies and her hearing step mother and step sisters prevent her from using her own language. Indeed, from the moment she meets Cinderella, the stepmother feels disgust at her step daughter for being death, describing her as “burdensome”. Despite talking about her as a burden, the stepmother forces Cinderella to do all of the work around the house, refusing to learn sign language and instead yelling at her step daughter. Cinderella experiences extreme isolation in her inability to express herself to her family and their prevention of her using her own language. She is only able to sign when she is by herself, engaging in sign singing with the animals around her while she works, tying a close bond to her animal friends and expressing her need for a change in the oppression she is experiencing every day of her life. Her community of animal friends refuses to let her give up on her dream of a change in her life, signing at her that she can make the impossible possible. When Cinderella encounters her fairy godmother, she discovers that the words her animal friends have been signing to her are a magic spell and she uses them to transform her rags into a magnificent gown. When this Cinderella finally meets her prince, she fears that he won’t accept her once he discovers that she is Deaf and will treat her the way that her stepmother and stepsisters have. But, when he sees her sign, he responds in sign, telling her that his kingdom uses sign language on the battle field. Before she can share details about her identity with him, she is forced to leave and loses her glass slipper on the steps. This Cinderella is able to distinguish herself from other women in the kingdom not by fitting into a glass slipper, particularly since her stepmother breaks the slipper, but, rather, through her ability to use sign language and she and the prince are able to create a kingdom of access by making sure that ASL is taught throughout the kingdom, preventing others from experiencing the isolation of being surrounded by those who can’t or won’t speak to them. Rosen’s tale is one of linguistic isolation as much as it is about being treated as a servant. It is about a denial of access to Cinderella’s language and culture, her ability to express herself, and her ability to be part of conversations around her home. This is a tale about a revision of a society that privileges spoken languages into one that provides a space for bilingualism, allowing for ASL (standing for Amina Sign Language) and English. Rosen’s Cinderella doesn’t just change social status as many Cinderella characters do in fairy tales, rather, she changes the status of Deaf people in her kingdom, creating a space where language multiplicity is the norm. In ”Little Red Riding Hood”, Deaf storyteller Roz Rosen recasts Red Riding Hood as CODA (Child of Deaf Adult), and as a “GODA” (Grandchild of Deaf Adult). Rosen envisions her as someone who has grown up bilingual, speaking English and Sign Language, and someone who takes pride in her bilingual status and ability to communicate in two different modalities. When this Little Red Riding Hood encounters the Big Bad Wolf, she recognizes him as part of Deaf culture, an individual who has more in common with the Deaf community than he does with hearing wolves. This is a huge discovery for the Wolf himself, who hasn’t encountered Deaf culture or a Deaf community before. But, just as he is communicating with Little Red and her Grandmother, the hearing Woodsman appears and tries to assert his authority over the situation. Rosen’s tale is one about Deaf community and a resistance to the attempts by hearing people to impose their ideas over that community. This is a tale of “Nothing About Us Without Us” and a reminder of the history of hearing people trying to impose their ideas and perceptions of situations onto Deaf people. Rosen’s “Little Red Riding Hood” invites a happily ever after of Deaf people making decisions for their own community. It is a tale of communication and the power of communication to forge communities.